Bernhard Hoetger, sculptor, architect and designer, created this pair of cuff links for himself at the end the 1920s. Following Hoetger�s design and instructions, the turquoise pieces, with a rough veining, are differently set, accentuating the character of the handicraft. The back piece of the cuff links show old Nordic symbols in an expressionistic style. The variety of the stones and the almost roughly crafted golden parts create the special thrill and tension, which is typical for Hoetger�s expressionist sculptural work. This ring was created in France around 1930. The green gem and the white metal accentuate the cold lustre of the brilliants of this ring, which is typical of the Art Deco period. The ring originates circa 1930, the designer is unknown to us. The clear forms and colors of the coral and onyx underline the sparkling diamond in the center of the ring. The simple, semi cylindric form of the lapis lazuli, underlined through the simplest possible setting (a thin golden thread, holding the gem in place) emphasizes the qualities of this noble precious stone. Designed in 1926. A thin blue precious stone, set in white gold, rests on a heavy bright gold ring. The design, convincing in its clearness and simpleness, came from Denmark, around 1930. We also offer the ring (like the original) � in white gold with an onyx strip. The construction of these cuff links is amazingly simple. The combination of the elegant gem bar and the plump cubic setting of gold is quite striking. The original, dating from the 1930s, has a bar of ebony instead of the gem. We offer these cuff links in different versions: in white or bright gold, with turquoise, onyx, coral or lapis-lazuli. The former Bauhaus pupil Hans Przyrembel already had his own shop and work shop in Leipzig, when he created this necklace, with ear clips and ring to match. For many years, the collier was in possession of his widow, who left us the original to enable a reproduction. The use of form and material corresponds in every detail with the experience and theories of the Bauhaus time of Przyrembel. The anonymous designer has very skillfully shifted the two penetrating surfaces. The surface with the brilliants seems to emerge from under the brushed, golden surface and place itself on top of it. Designed circa 1930. Anonymous design from1930. The globe segment of the Chrysoprase is consistently developed in the gold set semi-circles of brilliants on the sides of the ring. Unfortunately, the original, which was made available to us for the remake, gave no evidence about the designer. There are also very few pieces of jewelry known from Bauhaus artists, only some from G. Pap, Naum Slutzky and Hans Przyrembel. Without any question, the brooch shows clearly the formal style and conception, typical for Marianne Brandt; the bright, soft metal for the round form, the hard triangular shape for the dark stone. If the attribution is correct, the brooch was probably created around 1924. At the same time she created an ashtray, the lid of which shows similar proportions to the brooch. Probably designed in 1926, this brooch is remarkable in its simplicity. The alternating brushed and polished bright gold surfaces accentuate the beautiful blue of the gem. In the "Worpsweder Archiv" there are several design drawings of art nouveau jewelry from Heinrich Vogeler. Most of them were never made, and the idea of producing these items for the first time was very appealing. The brooch llustrates two cranes, holding a mirror between them. The opal was often used for jewelry during this period, and no precious stone is more suited to symbolize a mirror than the opal, with its bottomless depth. The drawing is not dated, but was probably made around 1900. The original necklace was made of bakelite cubes, a material often used in the 1930�s, for style jewelry. A rough diagonal notch in every onyx cube breaks and intensifies the lustre of the carefully polished onyx surface. The trumpet-formed intermediate pieces are made of bright gold. This necklace consists of alternating onyx and hammered white gold balls, kept together with heavy links and rings of bright gold. The effect of the necklace, the design of which corresponds to one from Jean Despres, circa 1930, is both powerful and elegant. This piece of jewelry was also designed around 1900. A much preferred motif of the Art Nouveau period were 'horns of plenty' out of which came pouring globes, symbolizing the rich and the full. 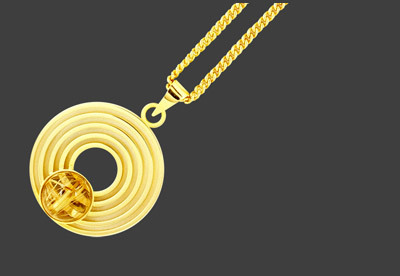 The heavy pendant is very skillfully attached to the chain, exactly as shown on Vogeler's detailed drawing. Here too the opal symbolizes a mirror. We had a silver chain with black, polished ebony pieces as a model for this collier. The simple angular onyx pieces of our remake contrast to the round flexible parts of white gold. The German design dates from the 1930s. The designer is unknown to us. The clearness of the baguette cut stone corresponds perfectly with the simplicity of this piece of jewelry. The large rock crystal is flanked by two black onyx bars. The use of different gold tones for the setting livens up the strict form. The pendant, designed in 1930, is stylistically very close to the works of the Swedish silversmith Wiwen Nilsson. This piece, designed 1927/28 by the silversmith August Haarstick ranges in the class of the most well known Art-Deco jewelers. Two rose turmalines are set in the roof formed pendant, where the surface is livened up by the alternating form and material (bright and white gold). This design is attributed to Gerard Sandoz, 1928, although we could not identify the original in our possession. The aqua marine is set in white gold, four pieces of onyx border the roof formed middle part, which is attached to a snake chain. The original French pendant from the 1930s, dates from the cubism-inspired Art Deco period. There is a clear formal relation with Jean Goulden. The original piece was worked with differently colored enamels. We have used pieces of different gems instead. The original design is probably from Gerard Sandoz, 1928. The piece, from which we have reconstructed our pendant differs clearly, both in dimensions and material from the ones shown in the literature. The pendant with the form of a stylized banjo, consists of two semi circular lapis lazulis and one longish onyx. The plate, worked of white and bright gold, is attached to a snake chain. This pendant was reconstructed from a photograph dated 1928. The strokes shaped inclusions of the rutil quartz cut the concentric rings, making up the circular form of this piece of jewelry. We have in our possession photos from Przyrembel, showing a different version of this pendant, however, none of the pendants exist. This brooch, created circa 1930, shows more of the playfulness of art deco than the strictness of Bauhaus. Surely, the brooch was manufactured in different variations. Our remake is a coral, set in white gold, with blue and red enameled flutes. Among the earliest designs (1922) by Gyula Pap is this jewelry brooch, which he designed while working at the Bauhaus. The original has survived and is in the possession of Mrs. Lenke Haulisch, Pap's widow. Segments of spheres of different sizes are the formal elements. The smallest is silver, the middle one a reddish gold, and the largest a bright gold.